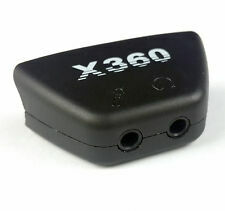 The X-BOX360 Headphone Converter is compatible with any common headphone or earphone. It can totally separate the microphone and earphone signal, so this converter is compatible with all kinds of headset for live chat. 1 x XBOX 360 Earphone converter. Compatible with xBox 360. Detail Image. USA, Canada, United Kingdom, Austrilia, France, Germany, Spain, Ireland, Italy, Others. Canada, United Kingdom, Austrilia, France, Germany, Spain, Ireland, Italy, Others. Features two 3.5mm ports that separate microphone and earphone signals. Key Features. Compatible with for X-b-o-x-3-6-0. In the unlikely event that you receive a defective item, we will replace it quibble free. It can totally separate the microphone and earphone signal, so this converter is compatible with all kinds of headset for live chat. Steelseries SPECTRUM Audio Mixer for Xbox 360. We will always go out of our way to source the product you are looking for. Input for Microphone & Headset. - Allows user to have conversation through headphone port. - Easy to use (plug & go system). Earphone / Headphone. Headset / Earphone. Two ports in the converter, they can totally separate the microphone and earphone signal. Jack for earphone microphone. Features two 3.5mm ports that separate microphone and earphone signals. 1 x Headphone Converter Adapter For Xbox 360. Function: Headset converter for XBOX360, One 2.5mm audio interface to two 3.5mm audio interface, separate the microphone and headset function. We will always here to solve them for you. Whether the wireless headset: wired headset. Fit for Xbox 360. 1 x Headphone. Yes or No Microphone: Yes. Ways to wear: head wear. We will try our best to reduce the risk of the custom duties. Detail Image. Turtle Beach earforce X12 Headset for Xbox 360 with adapter and cables. Once used every day but has spent many years sat in a drawer. In great condition and works like new. Comes with all cables in pic - sold as seen. Also comes with adapter for right and left as seen in pic. Great headset at a bargain price. No refunds, returns or exchanges will be accepted due to change of mind. Earphone converter for XBOX 360 x 1. Compatible with xBox 360. Also note that monitor settings may vary from computer to computer and may distort actual colors. If you have any problems, we are very glad to help you. Compatible with xbox 360. Connector: 3.5 mm female Jack. Then you can have conversation with multi-player,when for XBOX360 console is entering to online play. Insert the earphone in the converter. 1 x Headphone Headset Converter. UK Adapter. US Adapter. EU Adapter. 1Piece Headset Adapter for Xbox 360. - Cable Length: 1m/3ft. 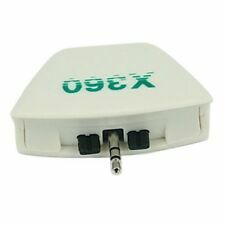 Headphone and microphone jack 3.5 - for Microsoft Xbox 360 Xbox360 adapter. To connect headphones to the Jack 3.5 mm on your XBox 360. No need to buy expensive headphones specifically designed for Xbox 360. 1 x Headphone Converter Adapter For Xbox 360. Function: Headset converter for XBOX360, One 2.5mm audio interface to two 3.5mm audio interface, separate the microphone and headset function. 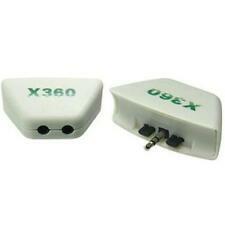 Earphone converter for XBOX 360 x 1. Compatible with xBox 360. If you have any problems, we are very glad to help you.